From left, standing: Rhett Pennell, Terrence Girard and KatieMcCall in “The Crucible” at Surfside Playhouse. Photo by Pam Harbaugh. 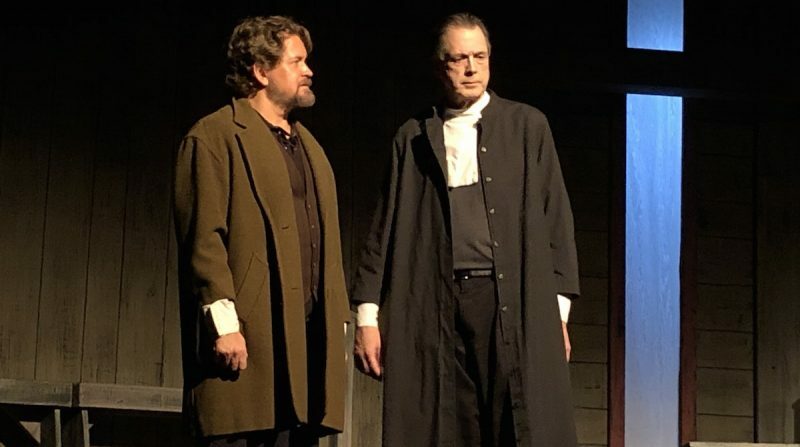 Talented, seasoned performers bring to life Arthur Miller’s “The Crucible,” a historical drama exploring truth versus power on stage now at Surfside Playhouse. The 1953 Tony Award winner for Best Play was written by Miller as an allegory to the hearings of the House Un-American Activities Committee led by Senator Joseph McCarthy. Americans, especially those in the artistic community, were accused and persecuted for being communists. This Red Scare, or McCarthyism, led to Miller also being brought before the committee. He refused to identify anyone who had been at meetings with him and was convicted in 1956 of Contempt of Congress. The play opens as Betty Parris (Ava Wolfenkoehler) lies motionless in her bed with an “unnatural” illness. Her father, Reverend Sam Parris (Anthony Mowad), had discovered Betty and her friends, including their leader, Parris’ niece Abigail Williams (Katie McCall), participating in a pagan ritual in the forest the previous night led by his Barbadian slave, Tituba (Chloe Collins). Concerned about losing his position and his wealth, Parris invites an expert in witchcraft, Reverend John Hale (Steven Wolf), to Salem to examine his daughter. More complications arise as John Proctor (Rhett Pennell) enters. He is a sharp-tongued local farmer who carries a secret. He had an affair with Abigail while she worked for him and his wife, Elizabeth (Joanne Maio), at his home. This led to Abigail being subsequently fired by Elizabeth. Abigail, who still has feelings for John, is angered to hear that John no longer cares for her. Concerned that his good name will be ruined, he hesitates to expose Abigail when she tells him that she and the girls are falsely confessing to practicing witchcraft. The hysteria grows as the girls accuse more and more Salem citizens of witchcraft, including John’s wife Elizabeth. Hale orders the accused to be arrested and sends for Judge Danforth (Terry Girard) and Judge Hawthorne (Edward Johnson) to try them in a court of law. John also finds himself accused and must decide between honor and hanging or life without honor, by confessing to a crime he did not commit. 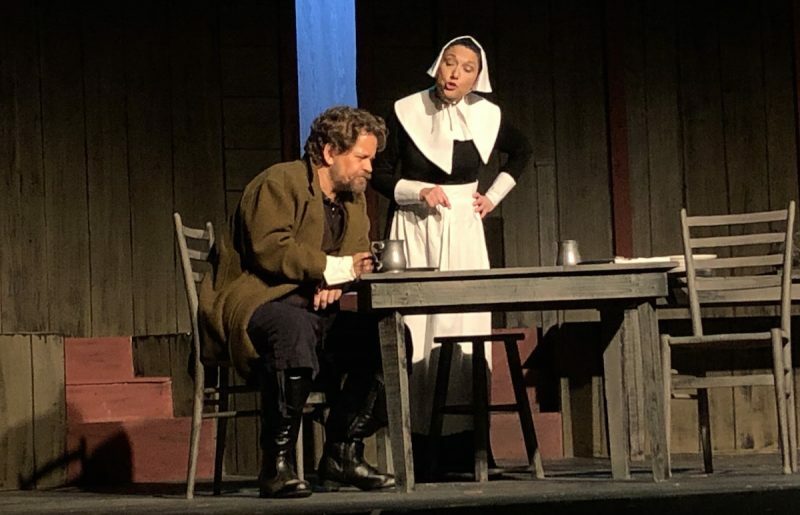 Rhett Pennell and Joanne Maio in “The Crucible” at Surfside Playhouse. Photo by Pam Harbaugh. From the opening madness of the first act to the heart-rending conclusion of the production, Bergeron makes smart directorial choices. His simple scenic design and Matt Davis’ equally simple lighting design work in effective harmony with the story. But it is Bergeron’s casting decisions that make this production a winner. This is a large cast that works seamlessly in intense, often spine tingling scenes that keep the audience involved and focused as the plot unfolds. Three really strong actors, Terry Girard, Steven Wolf and Rhett Pennell lead this outstanding cast. Judge Danforth’s court is based on the theocratic society of Salem, in which the state and the Puritan church are one. Everything and everyone is in the hands of either God or the devil, and to disagree with the state indicates a satanic undertaking. Danforth believes that rooting out witchcraft is his judicial responsibility. Girard’s Danforth takes control of his courtroom and strongly believes that his judgments once made should not be reversed. Girard’s haughty, icy and rigid interpretation of his character is masterful. Steven Wolf gives a powerful performance as the Reverend John Hale. Hale goes through the most complex moral transition in the play, and can be seen declining physically; becoming more and more distraught as he suffers internally from remorse. He cannot hold back his tears. Rhett Pennell, as John Proctor, commands the stage with every entrance. His energy and physical presence electrify his scenes as he tries to create reason where hysteria reigns. Pennell brilliantly shows his character’s strength in the last act as he is brought out beaten and in chains for one final visit with his pregnant wife before his hanging. In this beautifully performed scene, Ms. Maio’s Elizabeth forgives John for his affair with Abigail. Other members of this talented cast included: Becky Behl-Hill and Chris Tsocanos (Ann and Thomas Putnam), Steven Mogell (Giles Corey), Linda Nicoli and Charlie Mixon (Rebecca and Francis Nurse), Blake Evridge (Ezekiel Cheever), Paul Durney (Willard), Trinity Lyons (Mercy Lewis), Marea Pennell (Susanna Walcot), and Amanda Gazy (Mary Warren). “The Crucible” is an important play for all times. Arthur Miller wrote an essay, “Why I Wrote the Crucible: An Artist’s Answer to Politics,” in “The New Yorker” on October 21, 1996. A quote from that essay rings true for today’s politics: “Few of us can easily surrender our belief that society must somehow make sense. The thought that the state has lost its mind and is punishing so many innocent people is intolerable. And so the evidence has to be internally denied.” Be vigilant! There are witches among us! SIDE O’ GRITS: “The Crucible” runs through Jan. 27 at Surfside Playhouse, 301 Ramp Road (5th Street South), Cocoa Beach, FL. Remaining performances are 2 p.m. Saturday and Sunday and 8 p.m. Saturday. Tickets are $25 general and $22 for military, student and senior. A $1.75 service fee may be applied to each ticket. Call 321-783-3127 or visit SurfsidePlayers.com.